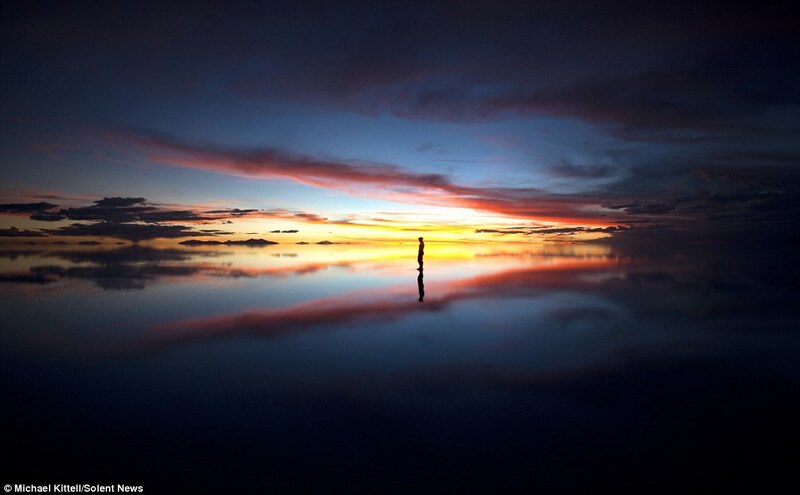 | Pic treat – Walking in the air: Mesmerising skylines reflected in water! Walking in the air: Mesmerising skylines reflected in water create a dream-like background for couple’s beautiful photographs ~ HAYLEY O’KEEFFE, MailOnline. 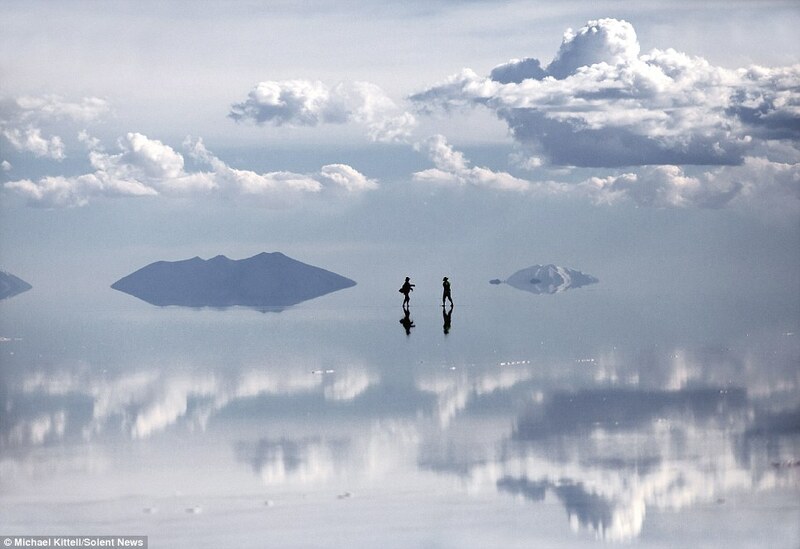 These stunning photographs reflecting a perfectly still landscape are like an image captured in a dream. 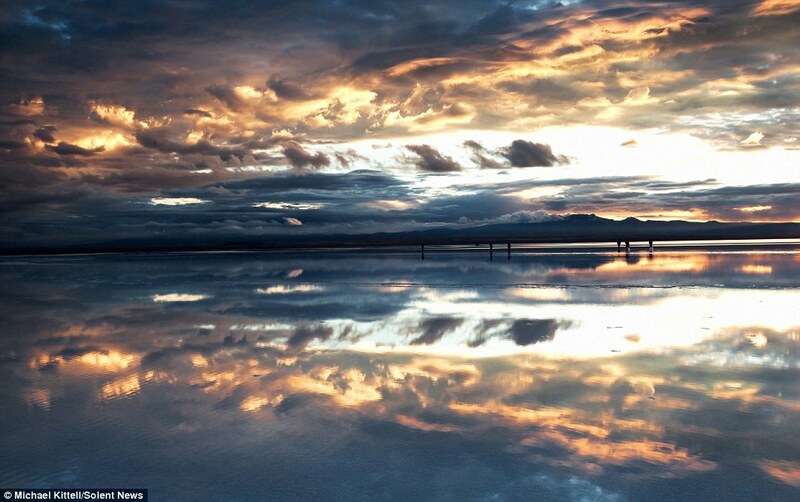 The amazing colours in the sky are mirrored in the still water covering the landscape for miles and miles. 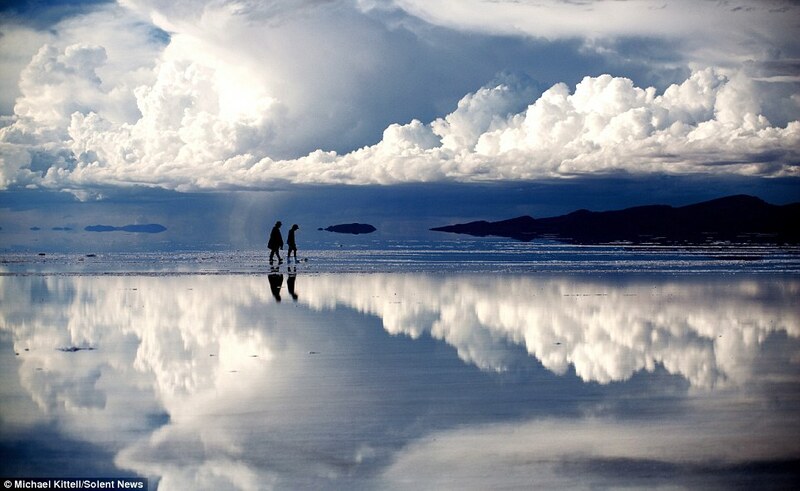 Photographer and lawyer Michael Kittell captured these colourful images when he visited the Salar de Uyuni in Bolivia with his wife, Taylor. And he believes that at 10,500 square kilometres, the world’s largest salt plain is one of the most beautiful places on earth. Here, at 12,000ft, a couple of centimetres of water covers the plain but sits perfectly still in the remote plain because there is no wind. And the stillness of the atmosphere allows the stunning skies to be mirrored perfectly in the water. Michael, 29, from Tillamook in Oregon, USA, said: ‘Although it may look like a beach, they are rather an expansive salt flat covered in about a couple centimetres of water for as far as the eye can see. 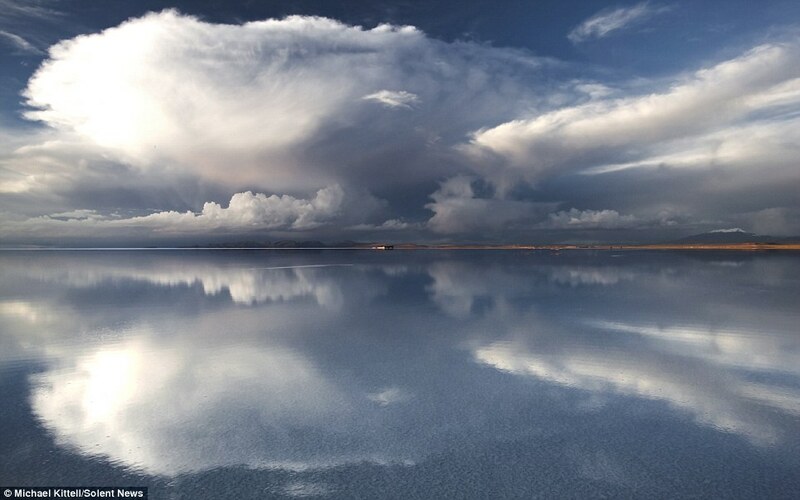 ‘The altiplano is an extremely arid area, but rain and snow-melt often result in shallow water covering the Salar de Uyuni salt flat for a short time each year. ‘When the wind is calm and the Salar is filled with water, the result is one of the most otherworldly dreamscape imaginable. ‘I was lucky enough to have fantastic cloud formations as well. According to Michael, the Salar de Uyuni is ‘out-of-the-way’ for almost everyone. It is most often reached by travellers who take an overnight bus from La Paz in Bolivia along remote and often bumpy dirt roads. In a couple of the photos, his wife can be seen practicing yoga, while in others people are simply admiring the scenery. Michael said: ‘I think the landscape depicted in these photographs is so clear because the Altiplano is far from any cities. ‘With an elevation of 12,000 ft, the air is thin and unadulterated by pollution. 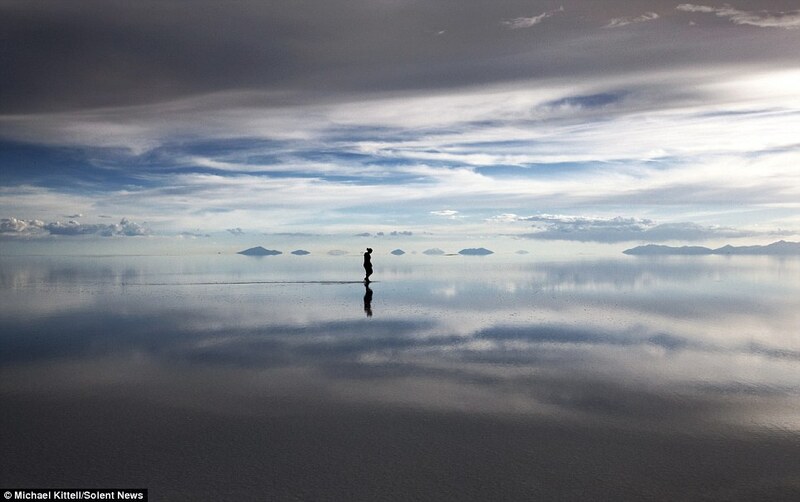 ‘The Salar de Uyuni is a rather popular attraction for people visiting Bolivia but its remote location makes any visit an inconvenient and time-consuming endeavor. ‘The staging town for the Bolivian Altiplano is Uyuni, a small and unattractive community full of tour operators peddling the exact same tour. ‘The town of Uyuni is a couple hours from the salt flats and the only accommodation on the salt flats is a small and basic “salt hotel”. ‘The hotel is amazing because it is literally made of salt, including all the furniture. ‘Almost all tours visit this salt hotel at the exact same time for only a couple hours each day and then leave well before sunset. 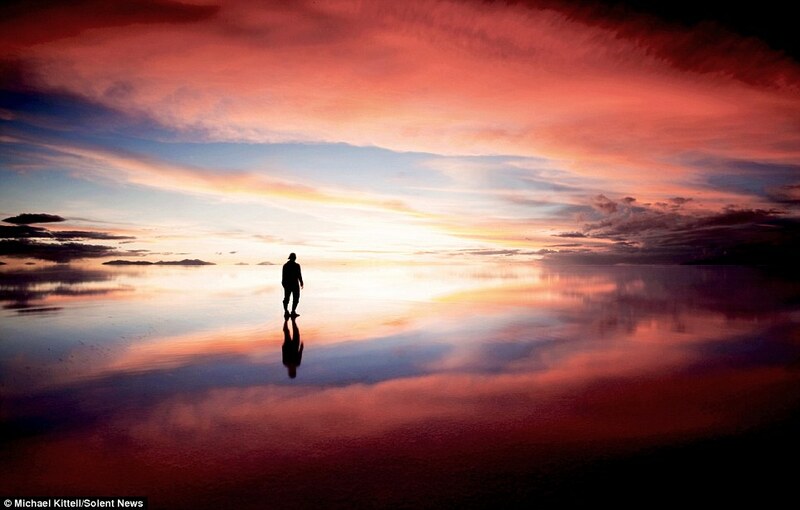 ‘The fortunate few who stay at the salt hotel have the entire Salar and its sunset and sunrise to themselves. ‘However, staying at the salt hotel is not easy – it took my group a great deal of research and perseverance to convince a tour operator to customise a tour so that we could stay there. 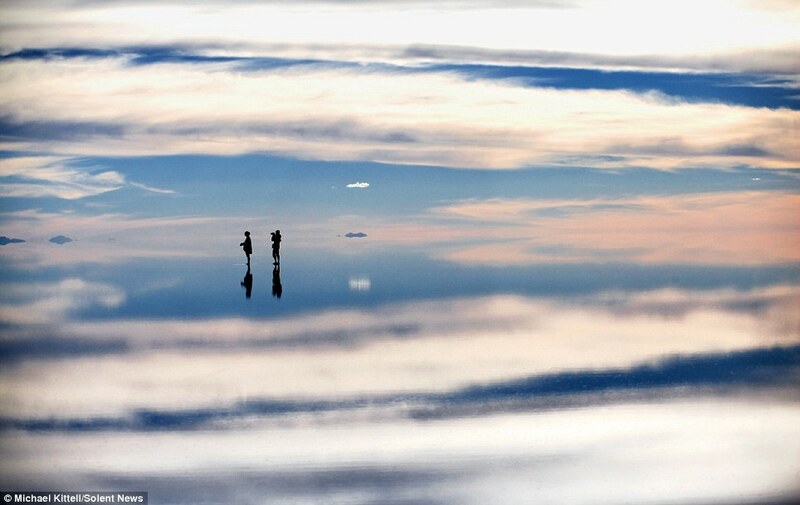 ‘Our time on the Salar de Uyuni was absolutely a highlight of our time in Bolivia. 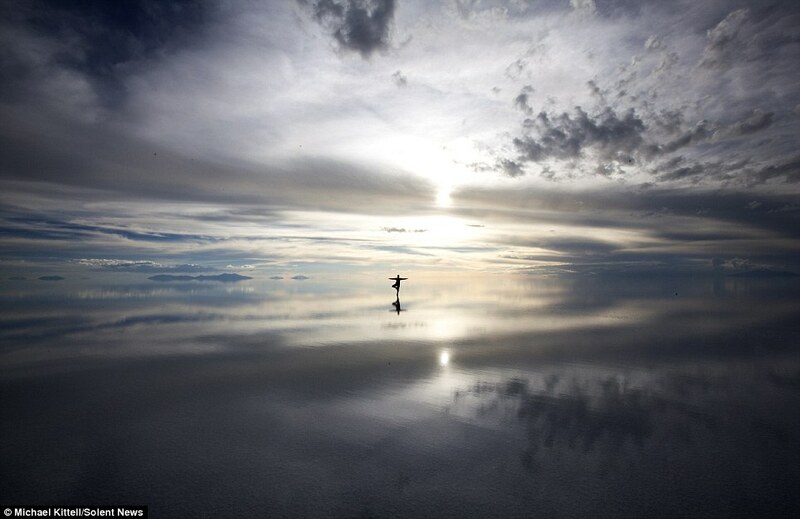 This entry was posted in World and tagged Bolivia, La Paz, MailOnline, Michael Kittell, Oregon, Photograph, Salar de Uyuni, Salt pan (geology), Uyuni by truthaholics. Bookmark the permalink.